XI'AN, Nov. 3 (Xinhua) -- More than 2,000 years ago, 25-year-old Zhang Qian set off from what is now the city of Xi'an as an imperial envoy. He opened up a route which later became the Silk Road, and brought back the seeds of grapes, alfalfa, pomegranate and flax from Central Asia to sow in Chinese soil. Today, about 80 km from the starting point of ancient Silk Road, in Yangling Agriculture Hi-Tech Industrial Zone, a national-level high-tech development zone in Shaanxi Province, 26-year-old Marat Muratkhan from Kazakhstan has started the new semester in Northwest Agriculture and Forestry University (NWAFU). He may not be an expert in ancient Chinese history. Muratkhan knows little about Zhang, or his feat, or that he had been to today's Kazakhstan. But with his expertise, he is continuing the work that Zhang dedicated himself to -- bringing ideas and technologies across cultures. The NWAFU has recruited 232 students from 11 Belt and Road countries and regions. Through them and many Chinese and foreign researchers in this small town of Yangling, the seeds of agricultural cooperation have been sowed under the Belt and Road Initiative, which was proposed by China five years ago. This is the second year of Muratkhan's doctoral study. Before coming to China, he worked as a researcher in agricultural institutes in Kazakhstan. 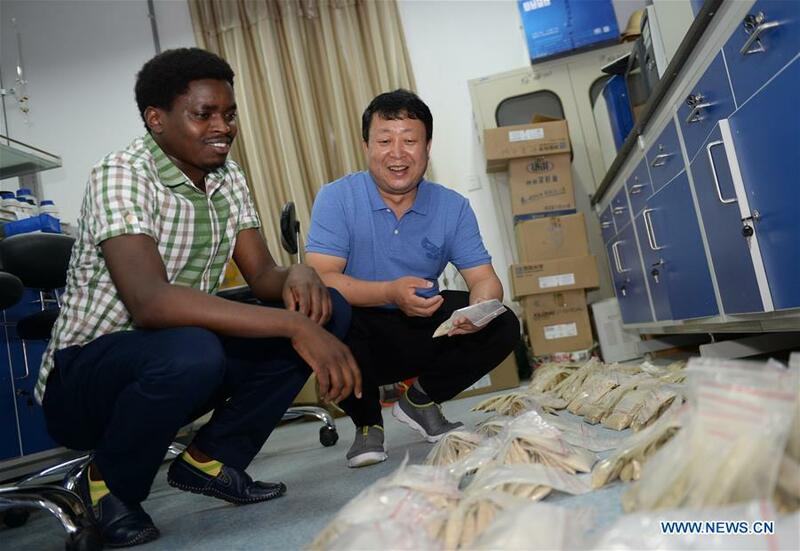 Last year, Muratkhan applied for the "Silk Road" scholarship set up by Chinese government and was admitted to the NWAFU. Muratkhan's research requires patience. He and his Chinese team have to select nine kinds of probiotics from the 250 kinds in horse milk. To capture these microorganisms, the "hunters" must work out the timetable of these little tiny beings, that often hide by day and come out by night. They also need a bit of luck. "It's like winning the lottery. It seems I wasn't very lucky. It took us eight months," said Muratkhan. But Muratkhan learned Chinese fast. Within a year he has become fluent in Chinese. So he sometimes acts as an interpreter for meetings with officials and scholars from Kazakhstan and China. "In the past I thought translation for this kind of meetings would be very simple, greetings and hand shaking. But, in fact, these days a broader range of topics are discussed. China and Kazakhstan have deepened agricultural cooperation in research," he said. "I was at most of the meetings between the Kazakhstanis and the people in Shaanxi, so I know this very well." The 24th China Yangling Agricultural Hi-Tech Fair held in 2017 attracted exhibitors from 35 Belt and Road countries and regions. More are expected at this year's fair, which is scheduled for Nov. 5-9. A Belt and Road agricultural cooperation roundtable meeting will also be high on the agenda at the fair. Back in the lab, Muratkhan's research spares him the toil of working on the test field. But Sajjad Raza, a doctoral student from Pakistan, has been busy harvesting wheat under the scorching sun. Raza became famous last year as photos of him reaping wheat like a Chinese farmer went viral online. He has been in Yangling for four years. To study the efficiency of nitrogenous fertilizer he and his Chinese research team have grown two batches of corn and three batches of wheat since 2015. Raza hopes his study can help address the problem of over-fertilizing in both Pakistan and China. Chinese authorities describe the Belt and Road not as a solo performance by China, but a chorus for all. "I hope I can join the chorus," said Raza. "By maximizing the effect of fertilizers, we can reduce their use. I hope I can help the farmers of China and Pakistan live better lives." Muratkhan didn't sow a single seed during his study in Yangling. But he has witnessed the germination of seeds sowed both in China and in his country. In 2015, a 200-hectare China-Kazakhstan agricultural innovation park was set up in Yangling, where experts from both sides work closely together to study breeding, water-saving irrigation, agricultural machines, and more. Five months ago, 57 Kazakhstani crop varieties were planted in Yangling. Around the same time, 57 varieties of crops from China took root in a test field belonging to North Kazakhstan State University (NKSU). This autumn, they reaped what they sowed. In Yangling they have bred wheat with a 82.3 percent higher yield, and a soy bean with a yield 32.7 percent higher than those in Kazakhstan. Kazakhstan is one of the world's top wheat producers and flour exporter. Wheat accounts for 85 percent of the country's grain crops. "Introducing the varieties bred here can help improve the production and disease resistance in wheat in Kazakhstan," said Muratkhan. "Cooperation like this is just what we need." "We plan to expand the three-hectare wheat test field to 20 hectares next year," said Altyn Shayakhmetova, dean of department of agriculture, NKSU. "We hope the high-quality wheat from Kazakhstan can also be introduced to and consumed in China." Muratkhan is also working with his Chinese supervisor and S.Seifullin Kazakh Agro Technical University to modify wheat processing technology in China. The hope is that Kazakhstan's wheat can be more efficiently processed and sold across a wider, global market. Grapes, and the alcohol made from the fermented fruit, were brought to China by Zhang Qian many centuries ago. Today, wine has become another area of agricultural cooperation under the Belt and Road Initiative. A Silk Road wine technology innovation alliance was established in Yangling in September by some 30 institutes and wine makers from across the world. Fang Yulin, head of the College of Enology, NWAFU, says that alliances, experiences and technologies being shared there mean that people all over the world will be able to taste better and better wine. NWAFU has joined 36 colleges and universities and 23 institutes from 11 countries to establish an alliance on Silk Road agricultural education and technology innovation. Yangling has signed agreements with over 20 Belt and Road countries and regions to deepen agricultural cooperation. "There's are no boundaries in science. We must be open and help each other," said Shayakhmetova. "The Belt and Road Initiative has given us a chance to work together to to the benefit of humankind. Cooperation and exchanges in agricultural research and technology mean we can embrace a better world."